When I saw a contest in indiblogger about ‘Love marriage or Arranged marriage’ I decided to write a post on marriage. Before I begin I need to tell you know whether I am married or not, I am single and am not thinking about marriage until I reach 26. This being the situation it will be totally inappropriate and unconvincing If I criticize or even say something about both love and arranged marriages. 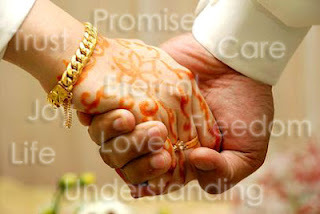 I may be able to say few goods and flaws of both type of marriages based on others experience –mainly my relatives and friends- but instead of that I wish to share the four fundamental principles of married life I understood from them, they are Communicate, Understand, Adapt and Trust. The principles are simple and everyone seems well aware of its importance, then why the number of divorces keeps on increasing day by day in our country. It’s a matter of great concern and one of the main reasons behind this is pre-marriage expectations about the life partner’s behavior. In earlier days even 20-30% completion of this expectation was enough for a marriage to have a happy or least an okay ending but now it has come up to 60-70%. So the faster our generation finds out that their partner doesn't match to most of their expectations, the quicker they go for a divorce. Then how did most of our earlier generation couples lead a happy married life using the same four principles. It’s because our generation lacked a key quality, a quality which is essential for the four principles to work in sync, that is Patience, needed not in surplus but enough. 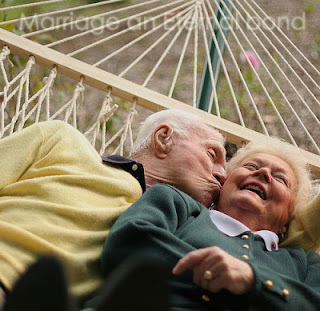 Love marriage or arranged marriage which is better, which can provide a long happy married life? To get a proper answer a survey on this matter is required; I have seen and heard of many lives that had flourished and many more that perished because of both kinds of marriages. Marriage is a responsibility, a responsibility to keep each other happy, a responsibility that had to be cherished and if even one of the partners is not ready to take this responsibility or can’t keep the other happy other than himself, then it doesn't matter what kind of marriage he/she is having. Marriage is the most sacred and purest rituals of all, the eternal bond it is said in our great epics, the bonding of two bodies’ into one mind, I wonder whether our generation believes in all this. One thing is evident though in future prolong married couples will become an endangered species and our next generation’s knowledge about such marriages will limit to twentieth century romantic novels. One of the posts for the contest, which clearly shows the mistakes of our generation... Good luck dude!!! Great write up :) :) ol da vei best!! this is ma point of view in regard to this topic :) read it n tell me hw u found it :) tcr!! yes i too thought like Jaishree-the 4 factors mentioned by youi.e-communicate,understand,trust &adapt are indeed very essential. Sensibilities is in younger generations too but how much of it? Highly debatable. Surveys are for business, not for the matters of heart. Surveys are not for business, they are to know the opinion of masses. neat views, very well penned. I wonder whether our generation believes in all this.